Getting started with do-it-yourself investing can seem like a daunting task. 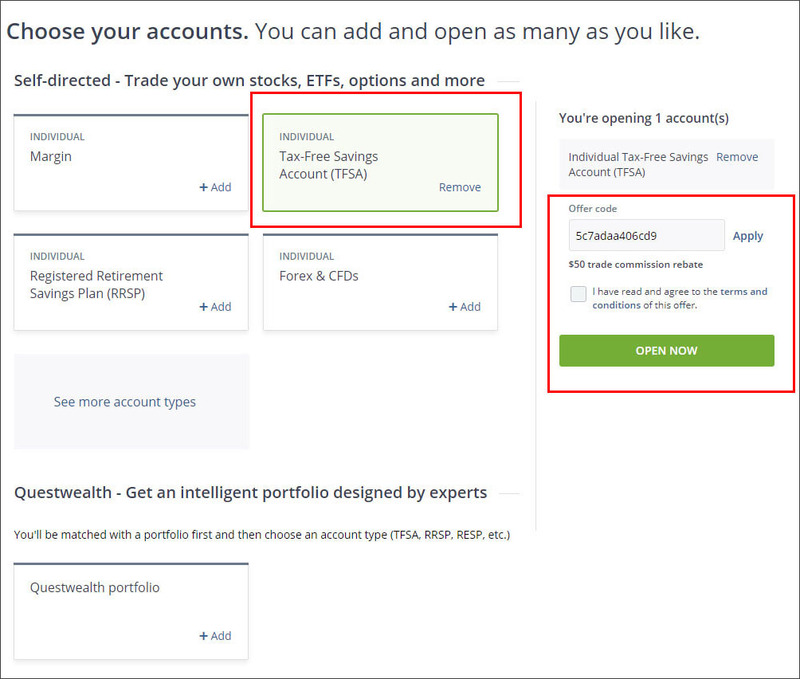 Part of the reason ETFs are as cheap as they are is because you, as the investor, need to do some of the work by registering for investment accounts, and buying the correct funds. In a previous guide, I wrote about how Questrade is one of the cheapest and easiest ways to invest in ETFs. 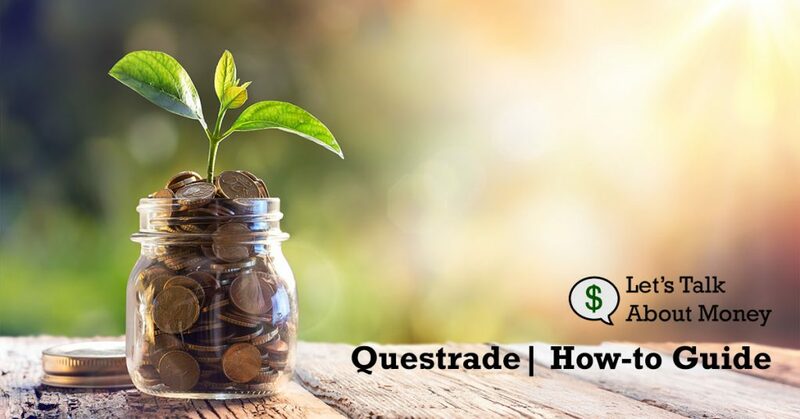 To make getting started even easier, I’ve put together a step-by-step guide on how to sign up to Questrade, and by using an offer code (5c7adaa406cd9), getting $50 in free commission fee’s as well! Read on to see every step of the process. The very first step to sign up to Questrade is to follow this referral link or use the offer code 5c7adaa406cd9 to start this process. This will allow you to redeem $50 in free trade credits. 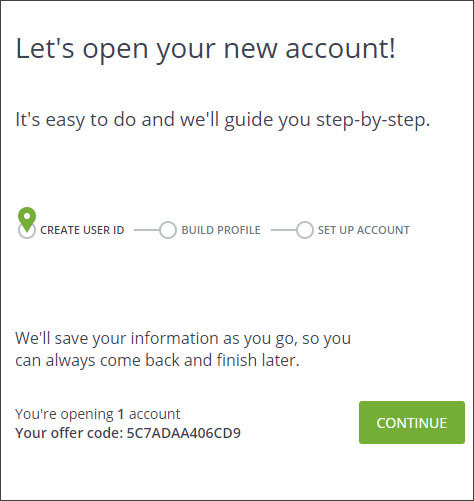 Now that you’ve started, select that account type(s) that you would like to open, and double check that the offer code has worked to make sure you receive your $50 in free trades. 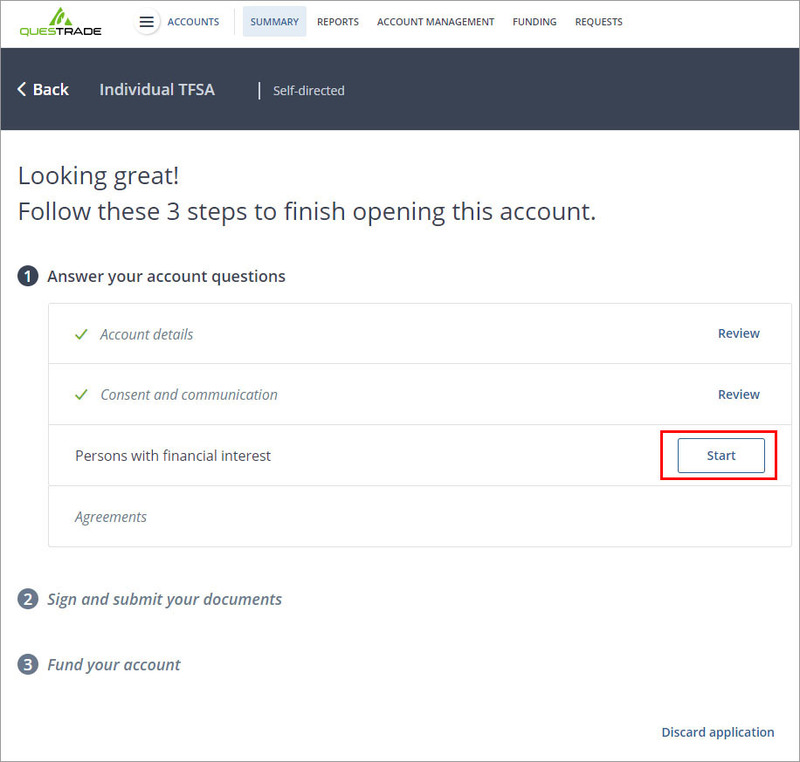 This guide will focus on opening a TFSA, but the process would work the same for the other accounts available. 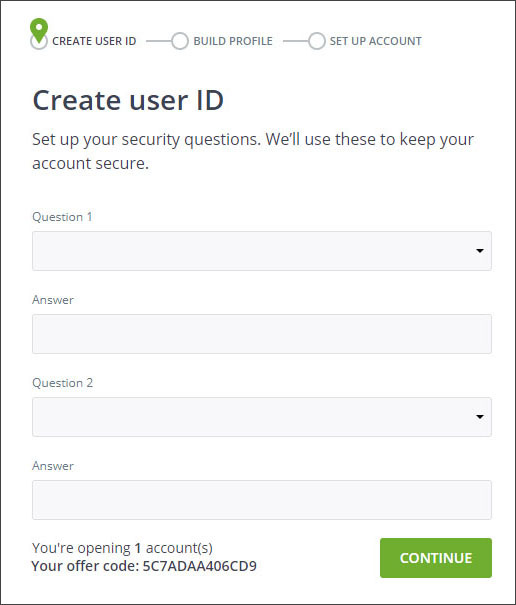 Now that you’ve selected the account type that you are opening, you’ll need to create a User ID. Press “continue” to move along in the process. Provide your basic contact information. This information is required to sign up to Questrade. Create a User ID and password. Your User ID can be anything. Since this is an account that will likely contain a lot of value, I would highly suggest using a long, secure password, that isn’t the same as any other password that you use. Definitely DO NOT use the same password as the email address that is connected to this account. If someone were to gain access to your email, they would then have access to your investment account. Now fill in your security questions. I don’t like to provide real answers to these questions, as they often have answers that are readily available on your social media accounts. 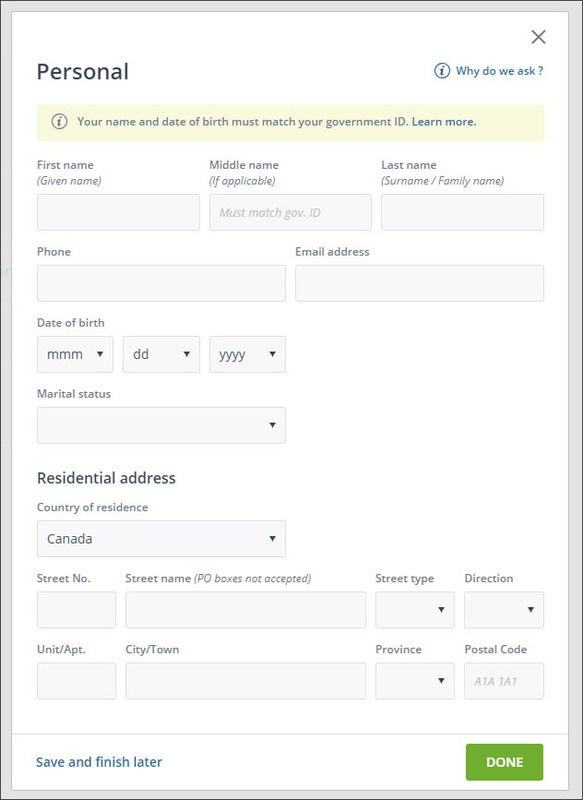 For example, if you use “Mother’s Maiden Name” this can often be found by looking at your friends list of Facebook. Use another answer, and write it down and store it somewhere. 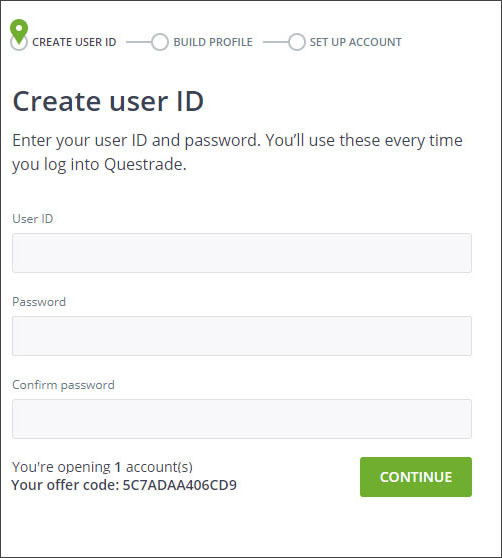 Now that you have successfully created your User ID, you now have to move on to building your Questrade profile. Clock on the “Continue” button under Personal. Fill in your personal information and double check that it is accurate. Any mistakes made here may be harder to fix in the future. If you set your Martial status to married or common law, you’ll need to also include your spouses information. This is because Questrade need this information to comply with securities regulations. 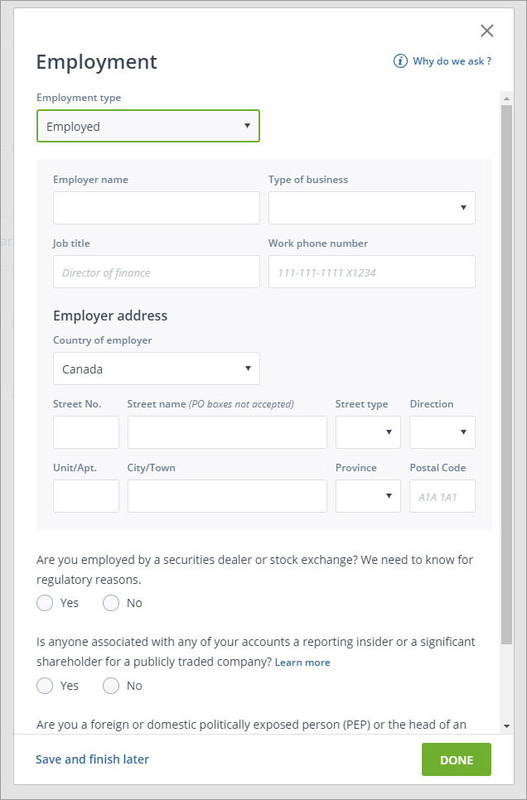 It helps Questrade determine if you or your spouse are insiders or controlling persons of a publicly traded company. 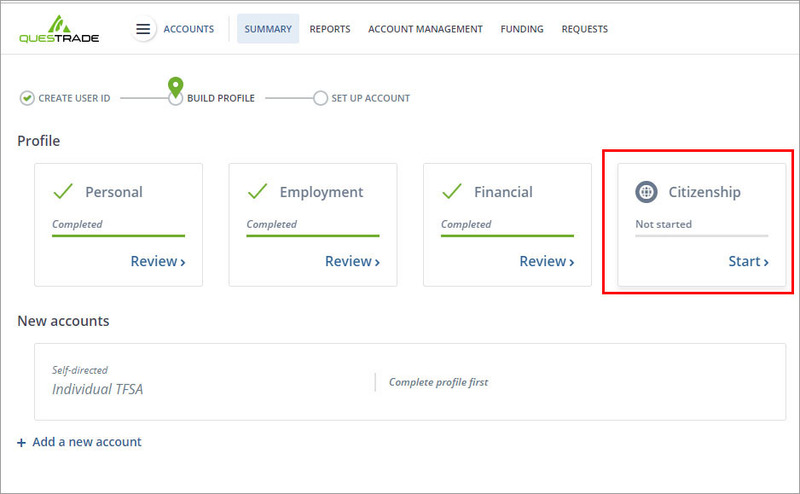 If you’ve completed your Personal section correctly, you’ll now see a green check mark in the box. 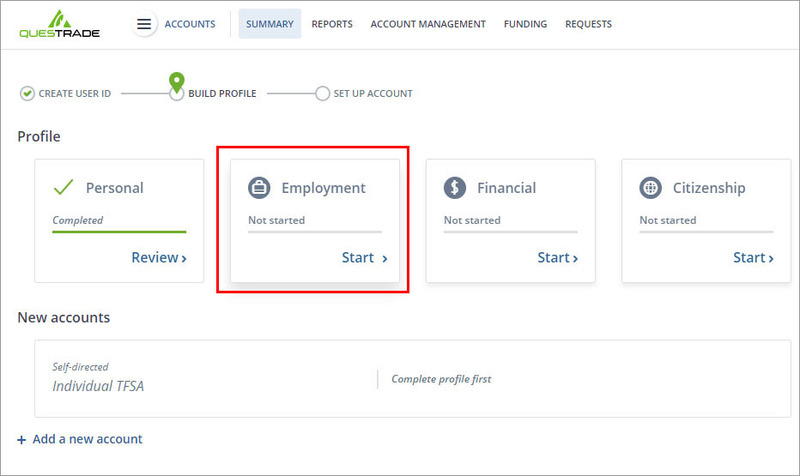 You can now move on to the Employment section by clicking the “Start” button. Fill out your employment information to the best of your knowledge, and select the appropriate responses to the questions that it asks. Again, you should now see a green check mark, if you’ve completed it correctly. 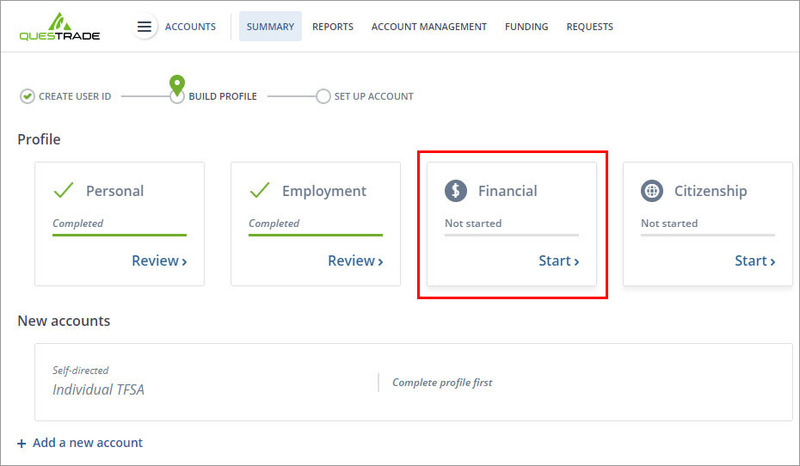 You can now move on to the “Financial” section by pressing the “Start” button. 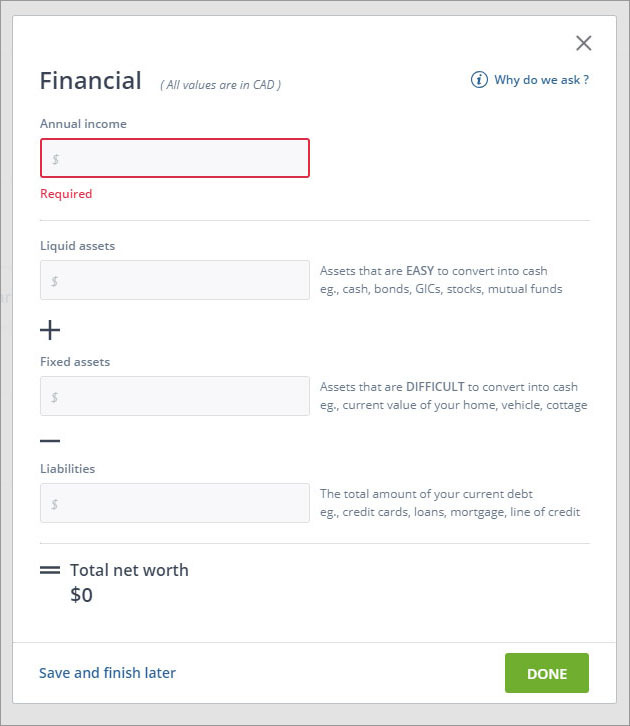 Provide an estimate of your annual income, liquid assets, fixed asses and liabilities to get an estimate of your total net worth. 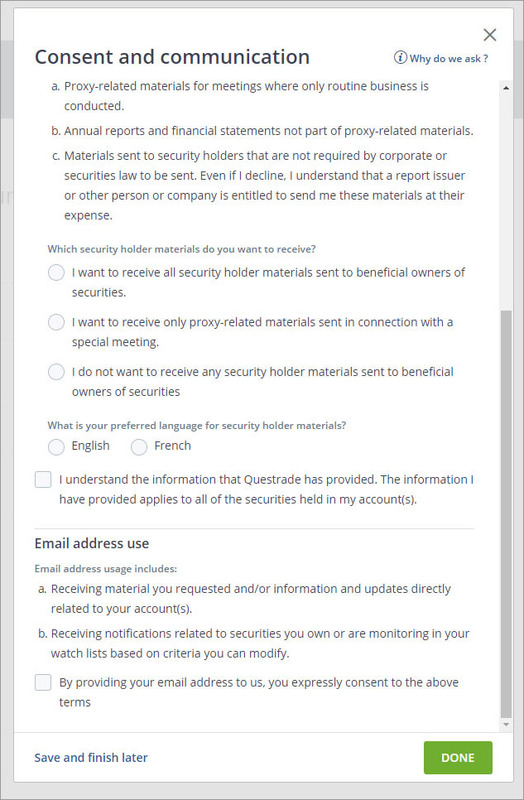 Questrade only collects information that they need and use, so this section (like all others) is required. 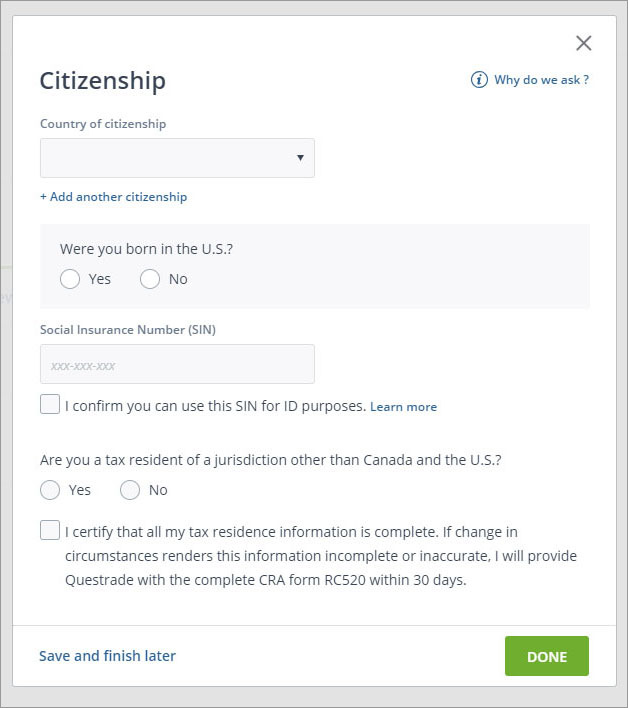 With another green check mark, you can now move onto the “Citizenship” section by clicking “Start”. Questrade collects Citizenship information due to different tax reporting and filing obligations for different countries. A SIN number is required to confirm your identity, and confirm that you are eligible for a registered TFSA or RRSP account. 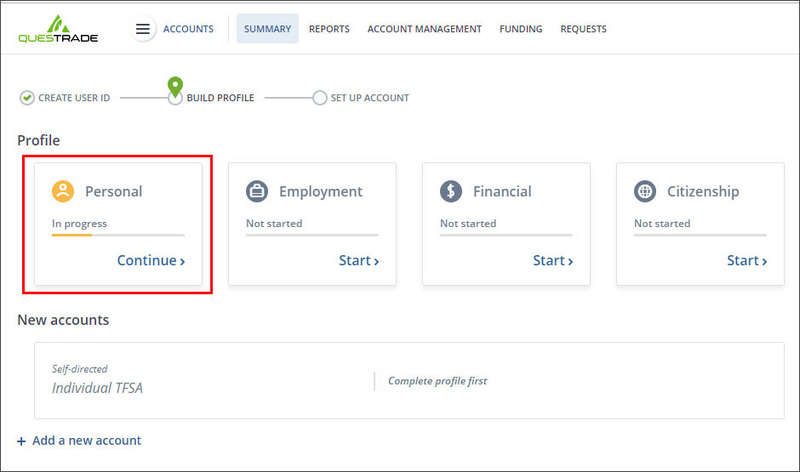 Now that you’ve completed your Questrade Profile, it’s time to setup your new accounts. 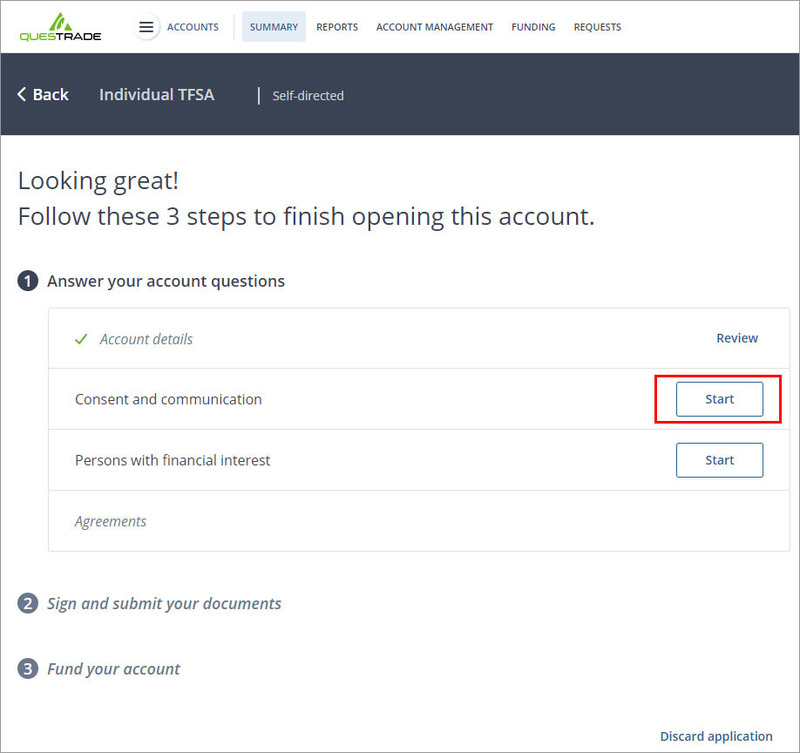 Click the “Set up your accounts” button to get started. 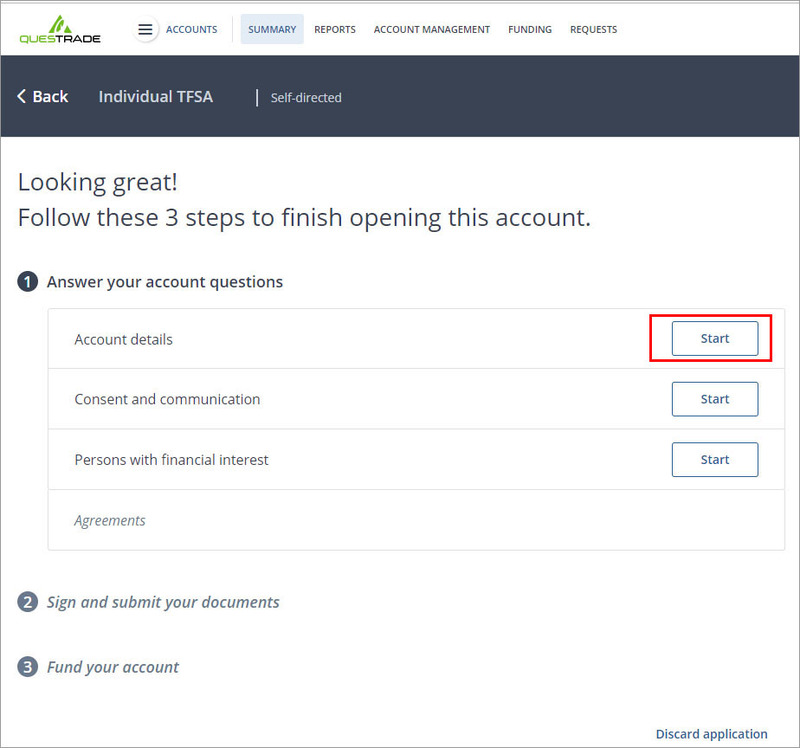 You’ll now need to complete 3 steps to finish opening your account. 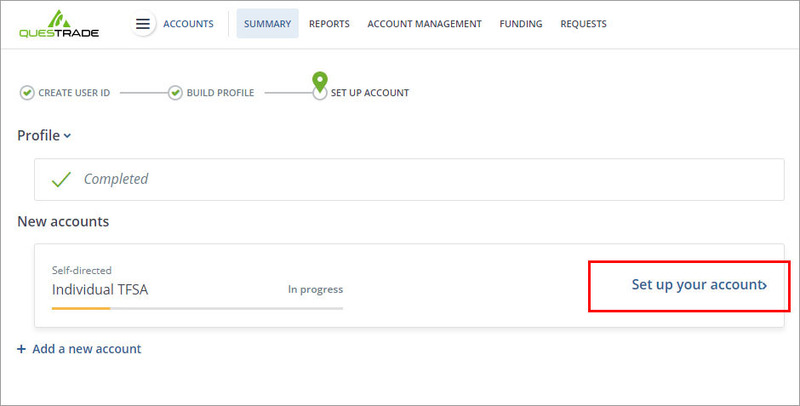 Click the “Start” button to move to the Account details section. If you are investing as a DIY investor, specifically looking at passive investing for ETFs, then you likely do not want to trade options. I won’t get into what trading options is here, but likely if you don’t know what they are, you don’t want to trade them. If you are investing in ETFs, you’ll want a minimum initial deposit of $5,000, as this will waive quarterly account fees (read more about that here). 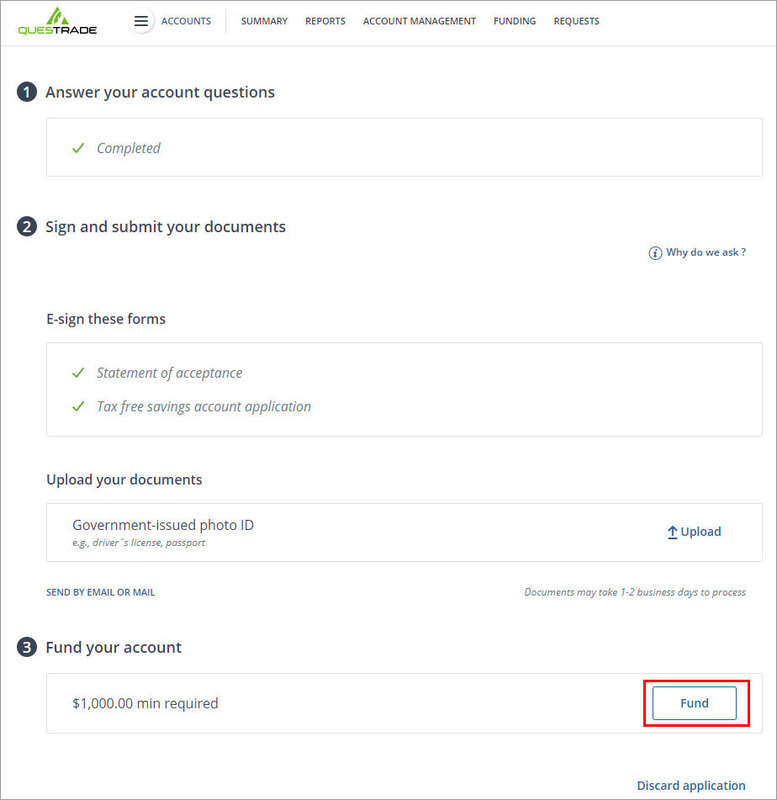 A green check mark will again indicate that you’ve correctly filled out the “Account details” section. You can now move on to the “Consent and communication” section by clicking the “Start” button. This section asks you questions related to when and how you receive informational materials related to the investments you make. 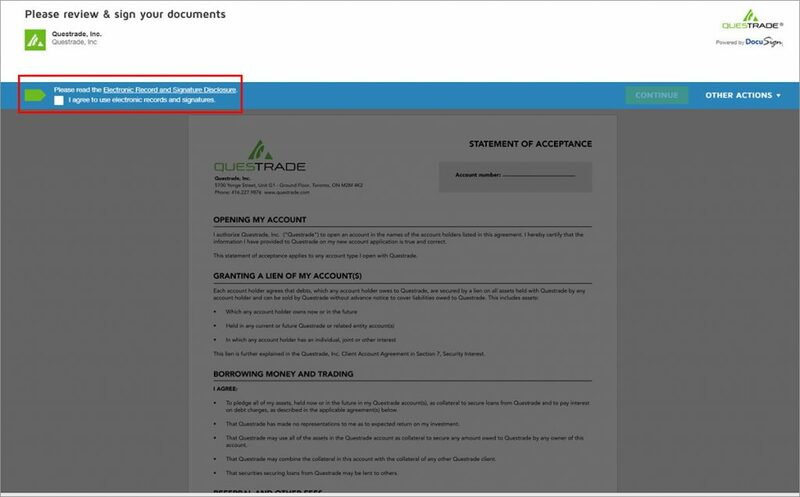 This section also details how Questrade will use your email address. 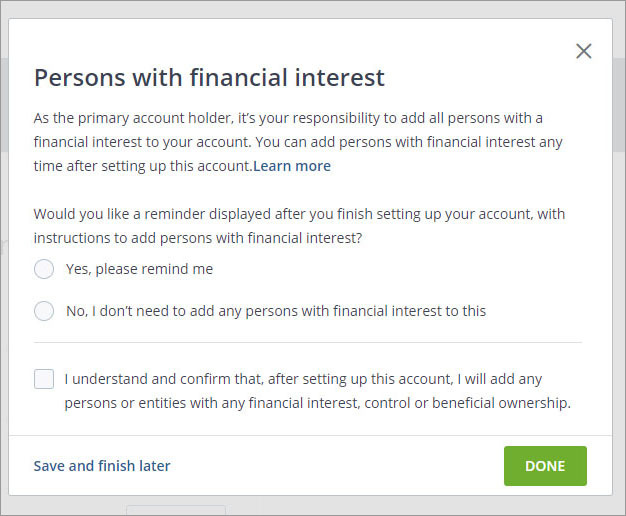 Now that you’ve completed the “Consent and communication” section, you can move on to the “Persons with financial interest” section. This section asks you to provide information about other people that should have access to your account, or be a beneficiary of your account. You may not think you need to add a beneficiary (especially if you are young) but you never know what might happen, and in the worst-case scenario, it can make things much easier for your partners and loved ones if you properly fill out your beneficiaries. 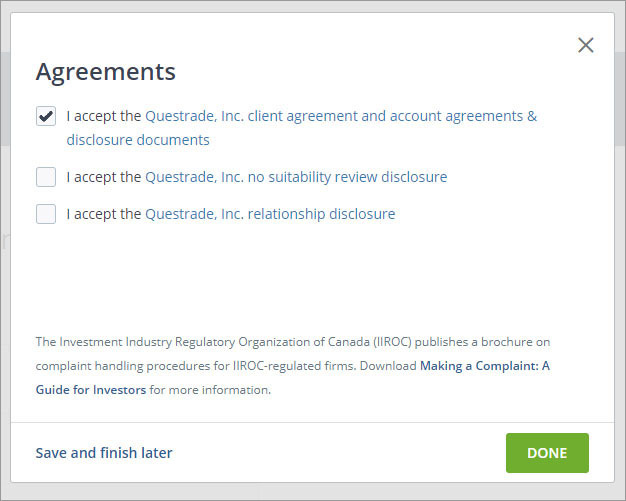 You’ll now need to move on to agreeing to Questrade agreements by clicking the next “Start” button. Clicking each box will display an agreement that you should read or at least skim over. It’s easy to always bypass the small print, but it can be a good idea of at least getting a sense of what you are agreeing to. 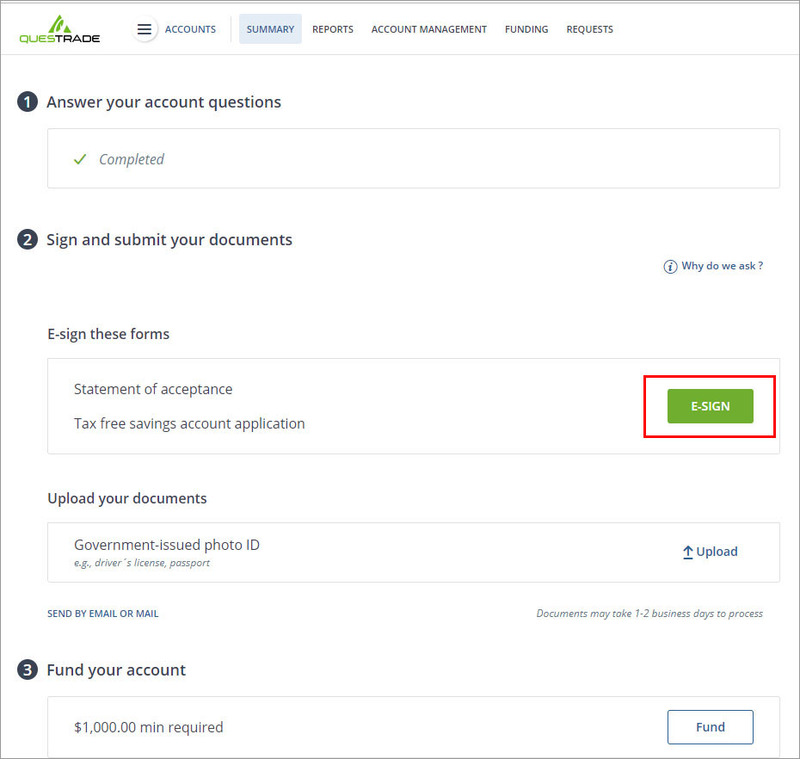 You now have to sign and submit your documentation agreement with Questrade. Luckily, this can all be done digitally, even the signing! You don’t have to print, physically sign, and mail in your documentation anymore. Click the “E-SIGN” box to get started. 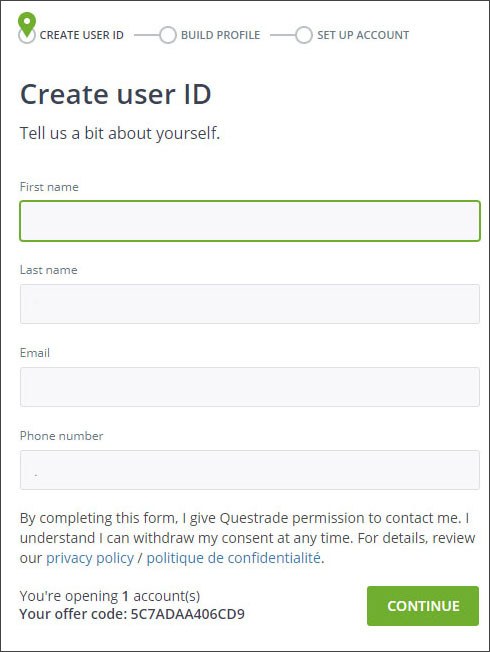 Questrade will now provide you a form. You will need to click the “agreement” box, and digitally sign the document in a few different places. Once you’ve read it and signed, click the green “Continue” button at the top right of the document. 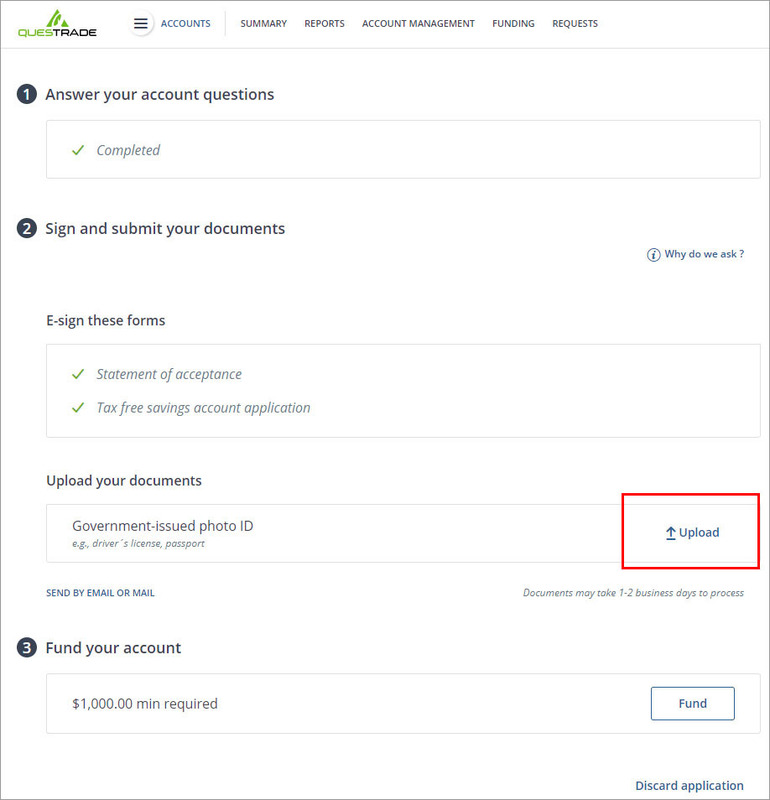 You’ll now see two green check marks to indicate that you’ve successfully digitally signed and submitted your forms to Questrade. 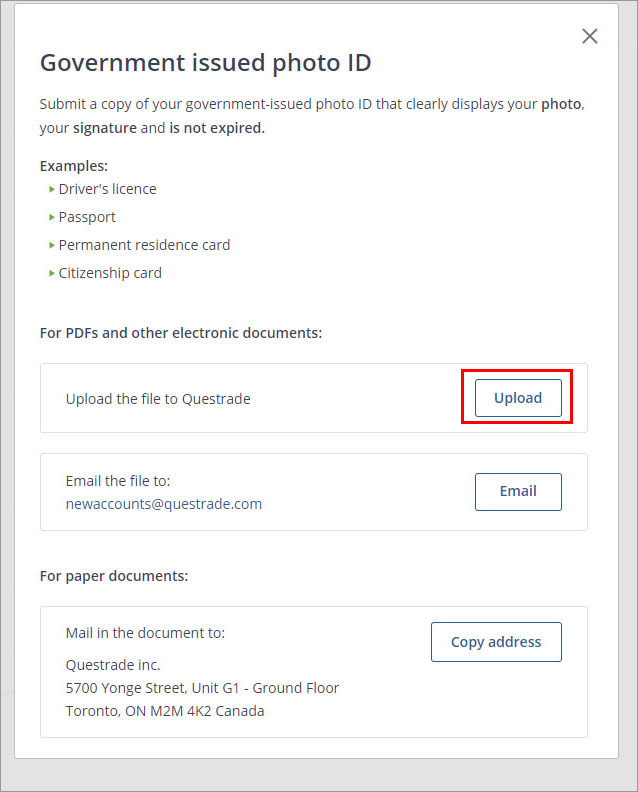 You’ll now need to provide government issued identification to confirm your identity with Questrade. Click the “Upload” button to get started. As you can see below, you can use a driver’s license, a passport, a permanent residence car or a citizenship card as your government ID. Make sure that it has your photo, your signature, and that the document has not expired. 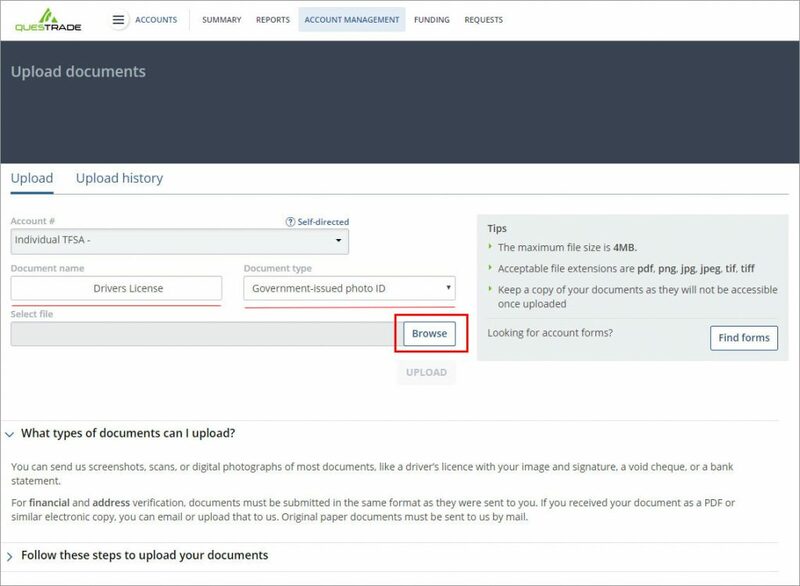 Click the “Upload” button when you have your document ready. The upload can be a PDF, PNG, JPG, JPEG, TIF, or TIFF file. This can be as simple as a picture of your drivers license with your cell phone. That’s what I did. Make sure that the file is under 4MB, select the correct document type, and give the document a name. Then click the “Browse” button, and select the correct file to upload. If this has been done correctly, you should get a pop-up displaying “Upload complete”. You can now close this window. It takes some time for Questrade to review files, so you won’t get an automatic green check mark in this section yet. So don’t worry if it doesn’t look complete in the list yet. The final step to creating your account is actually funding it. 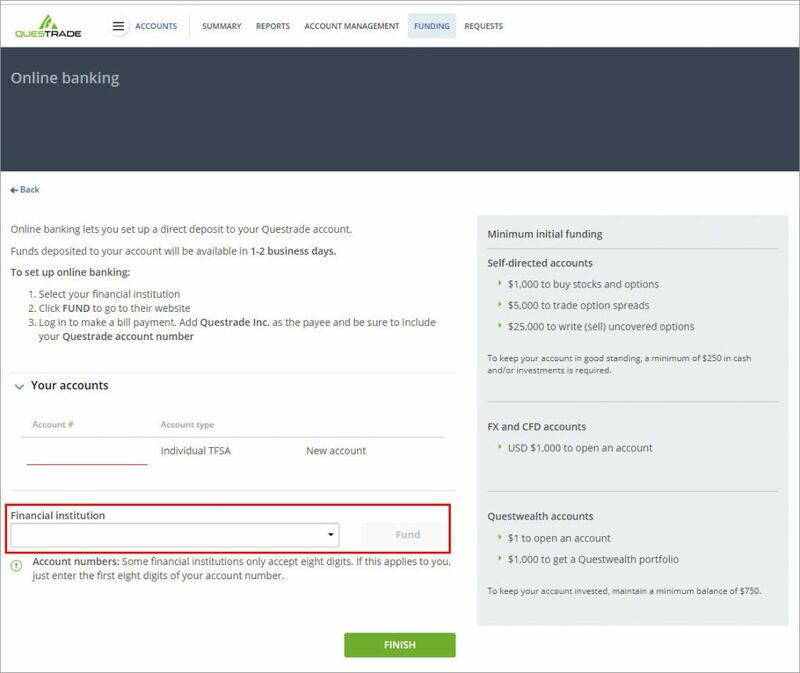 Funding your account is required for opening an account with Questrade, and a minimum of $1,000 is required. Remember, if you want to avoid account fees, I suggest funding with a minimum of $5,000. Click the “Fund” button to get started. 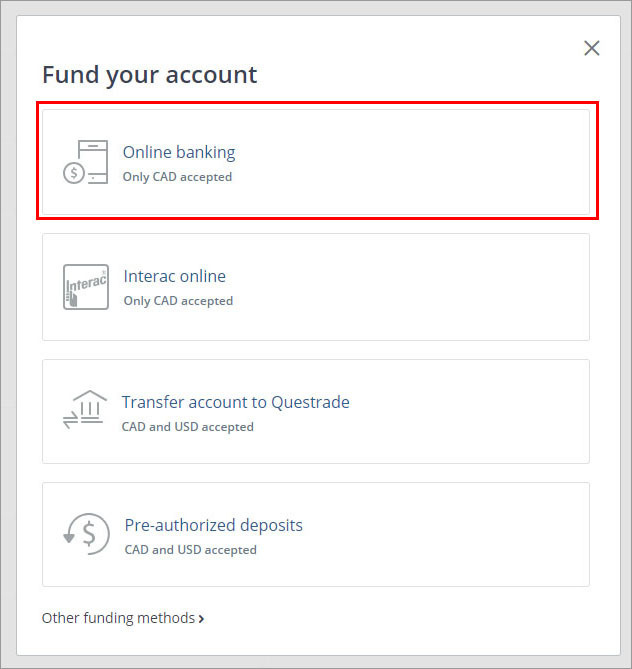 There are a variety of ways to fund your Questrade account. The easiest way I’ve found is through Online banking, and funding your account through a bill payment. To start this process, select “Online banking”. 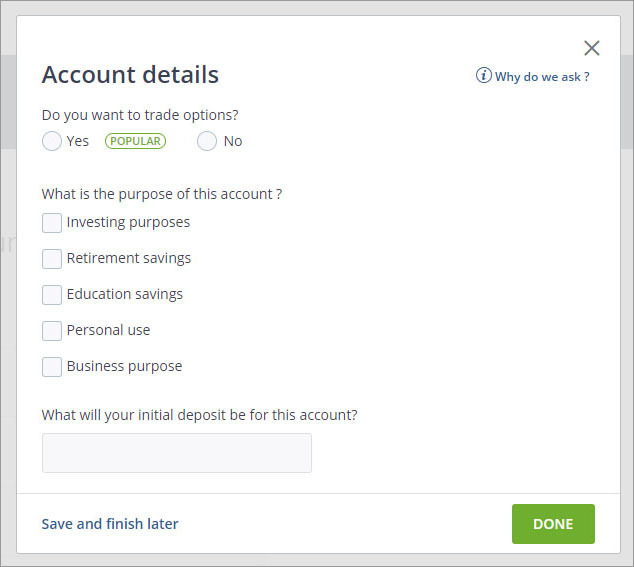 The following section will ask you to select the financial institution that you will fund your account from, and press the “Fund” button. 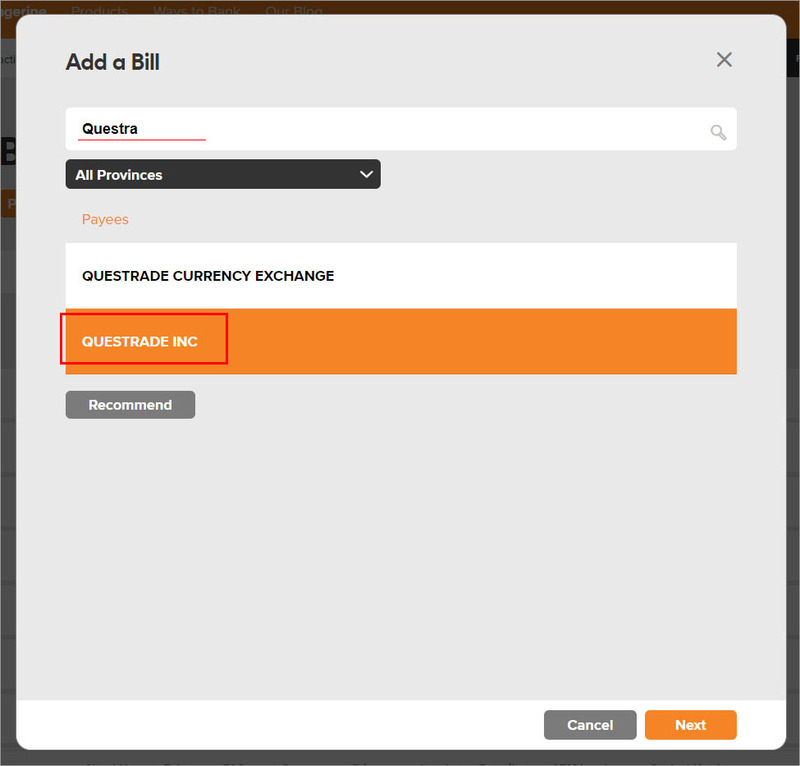 All this will actually do is take you to the web portal for whatever financial institution you select, and then you’ll have to manually add Questrade as a bill payee. 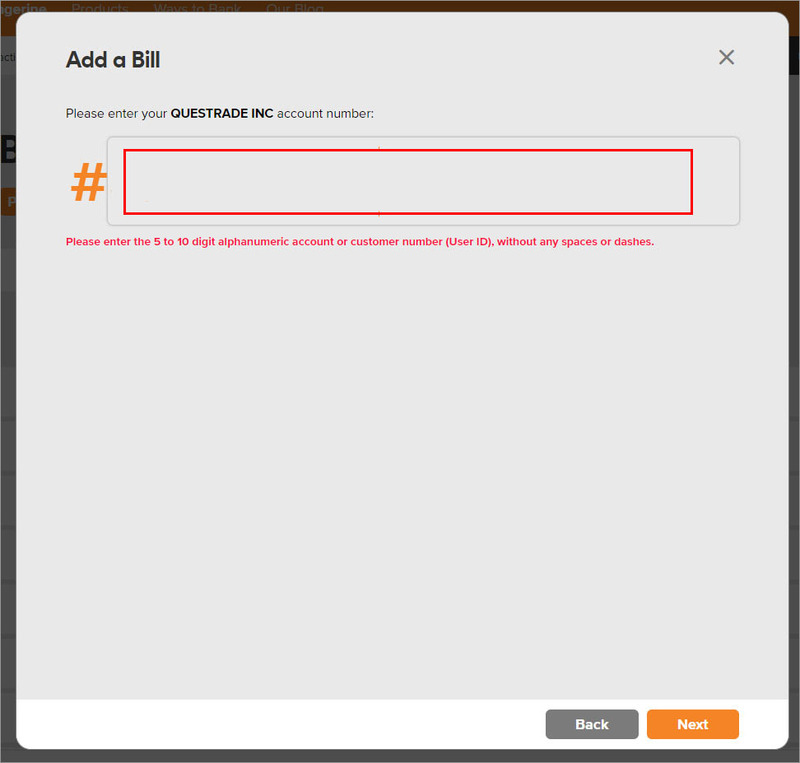 For this example, I use Tangerine as my day-to-day banking account, so I logged in, and added “Questrade Inc” as a bill payee, and added my new Questrade account number (which you can get in the previous image, but I’ve whited it out). I then made a bill payment of $5,000 to this new payee. Success! You’ll now have to play a bit of a waiting game. 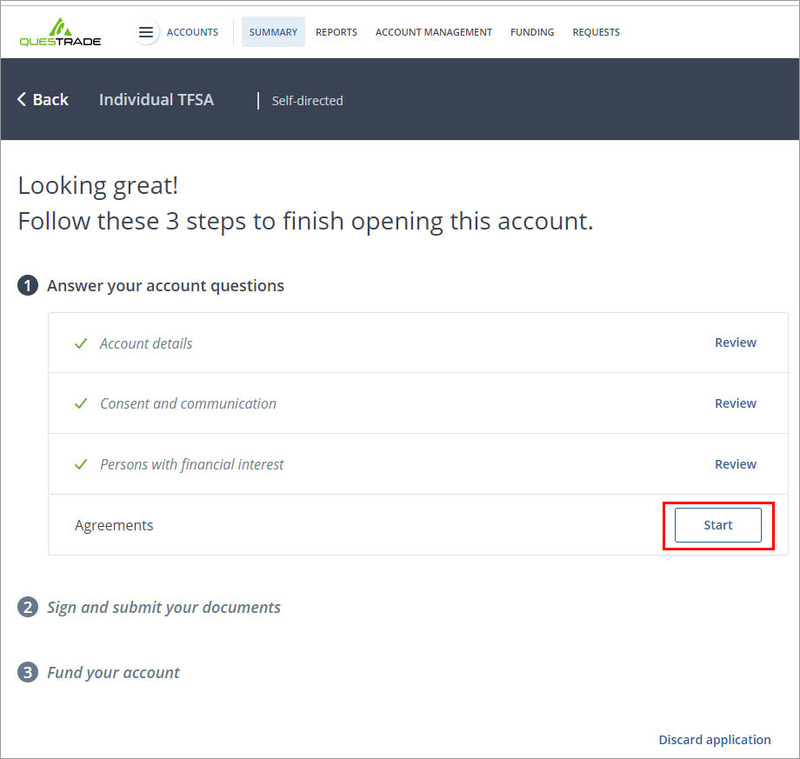 I created my account on a Saturday – Questrade reviewed and confirmed my documentation on the Monday, and my bill payment came through on the Wednesday at which point I was fully setup and ready to purchase ETFs. 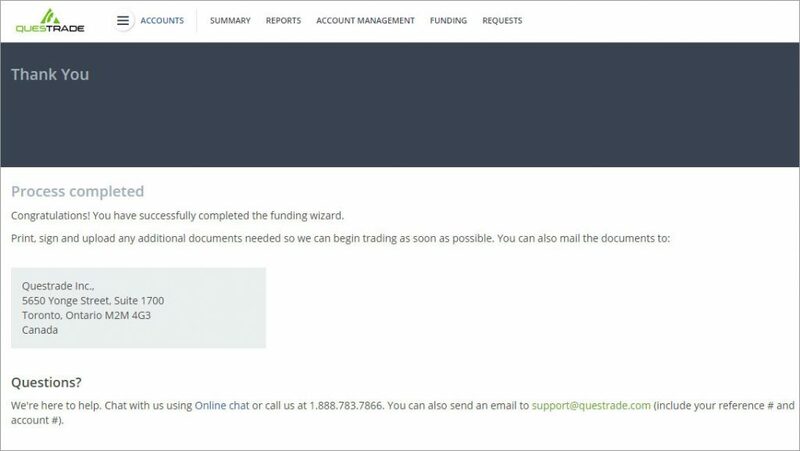 You’ve now successfully signed up to buy and sell ETFs (and other funds) with Questrade. After your initial funding amount has showed up, your account will be fully active. Check back soon for guides on actually purchasing ETF funds through Questrade, as well as guides on how to re-balance an ETF account in Questrade. And remember to use the redemption code 5c7adaa406cd9 or this link to get $50 of free trades when you start with Questrade. How about marginal accounts and associated fx fees. It is not mentioned anywhere and in the meantime Questrade will be lending you USD if you don’t do the conversion.